Rihanna lit up Coachella by shining bright Coachella look will become a festival fashion staple this year? The Bajan singer joked that she was reluctant to leave Coachella because not enough people had seen her outfit. The stylish statement-maker didn't go for the usual cropped top, denim shorts and wide-brimmed hat like many of the other festival-goers at the star-studded music bash in Indio, California. 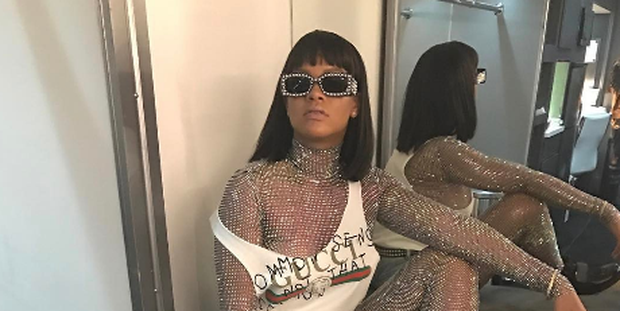 Instead, Rihanna wore a shimmering, crystal, head-to-toe Gucci bodysuit, complete with face mask, under shorts and a t-shirt. The 28-year-old wasn't performing at the music festival but she managed to show up everyone there. The image has already been liked more than 1.4 million times by fans, with many assuring the singer that they had taken note. “We see your outfit and love it!!!! !” said one fan. “Literally only you can pull this off,” said another. Several admirers also saw the funny side of Rihanna’s post. “Your caption is hilarious!” laughed one. “Outfit and caption on point!” gushed another.